The district court in the Hague has convicted 14 protesters for throwing stones at the Chinese embassy and has sentenced them to jail terms ranging from a week to 10 days. A demonstration against the Chinese suppression of the Uighur in Xinjian on Monday led to 142 arrests. Prosecutors said police released 110 demonstrators without charge and the remaining 18 are to appear in court at a later date. Demonstrators, most of them Uighurs living in the Netherlands, on Monday pelted the Chinese embassy building with stones and eggs. Windows were smashed and Chinese flags burnt. Ethnic violence erupted in Xinjian capital Urumqi on Sunday, killing 156 Uighur and Han Chinese, according to unspecified official numbers. Foreign minister Maxime Verhagen apologised to China’s top diplomat in The Hague for the damage caused, and promised that the Dutch government will pay for the necessary repairs. He emphasised that the right to protest is enshrined in the Dutch constitution, but he also condemned the violence. 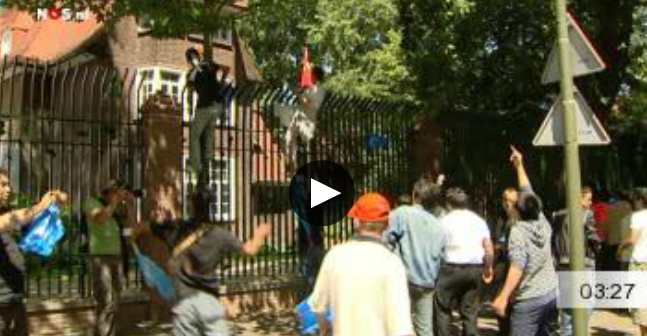 It is the second time in two years that the Chinese embassy in The Hague was attacked by anti-Beijing protesters. In March 2008 a pro-Tibet manifestation turned violent. A pro-Uighur demonstration on the Dam in Amsterdam on Thursday rallied about 50 people, according to the police. No incidents were reported there.